Quiet Riot drummer Frankie Banali was recently interviewed by Sydney Taylor of MA Entertainment Global. The drummer was asked about the chances of a Heavy Bones reunion. 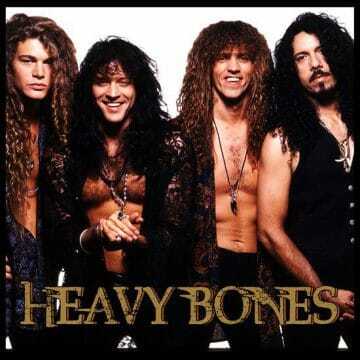 Heavy Bones consisting of Banali on drums, Gary Hoey on guitar, Joel Ellis on lead vocals and Rexx Tennyson on bass released one self-titled album back in 1992. In early 2012, Ellis mentioned to Sleaze Roxx that a Heavy Bones reunion would most likely happen in the summer or near the end of summer 2012. “That Heavy Bones was a great, great record. I’m really proud of that record. It came out at the completely wrong time… where that type of music and that type of production was really frowned upon [by] the whole grunge movement, which was more organic and more raw. The chances of that happening, I stopped saying ‘never’ quite a while ago, so you never know — but I don’t see it happening for a couple of reasons. One, I’m really busy with Quiet Riot and all my other side projects that I do, as is Gary Hoey, who has a really, really wonderful solo career on his own. The original bassist, Rex Tennyson, has literally disappeared off the face of the earth. I’ve been trying to find him for at least a decade, and I can’t. I know he’s not dead, thankfully. Joel [Ellis], the singer, is still around. I think he’s the one that wants it to happen the most, but I don’t see it in the cards. heavy bones – 4:AM T.M. Sydney Taylor sits down with legendary Quiet Riot drummer Frankie Banali. They discuss the band’s new live album One Night In Milan which is out on January 25th 2019 via Frontiers SRL, the legacy of Metal Health, the state of new music, and more!